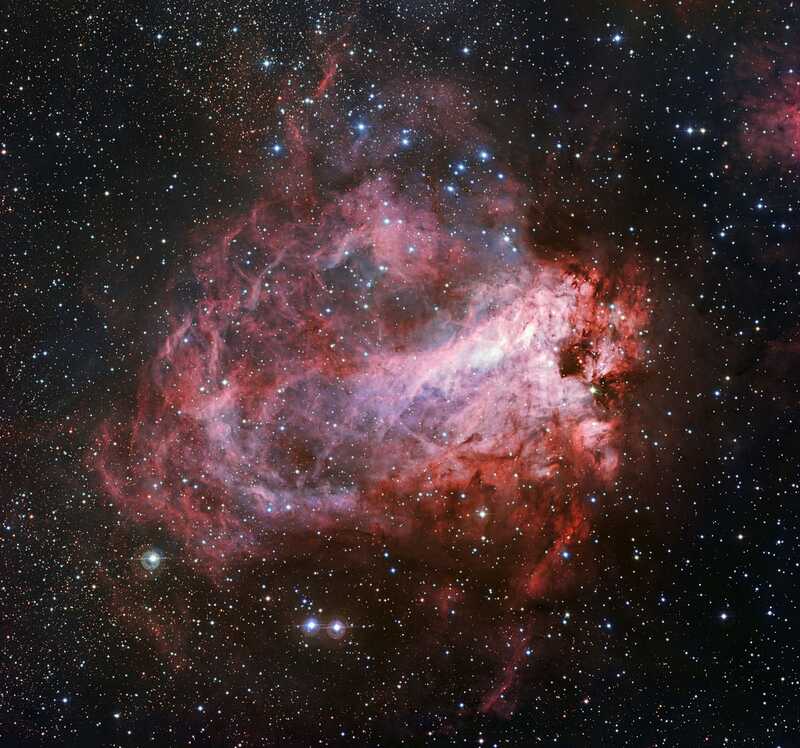 Messier 17 (M17), also known as the Omega Nebula, is a famous star-forming nebula located in the southern constellation Sagittarius. The diffuse emission nebula lies near the constellation’s northern border with Scutum, at a distance of 5,000 to 6,000 light years from Earth. It has an apparent magnitude of 6.0. M17 is also known as the Swan Nebula, Lobster Nebula, Horseshoe Nebula and Checkmark Nebula. 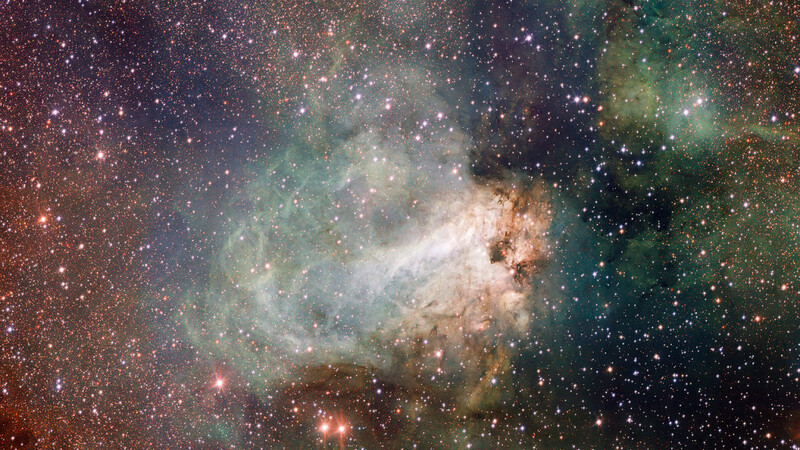 The Omega Nebula is one of the brightest star-forming nebulae of the Milky Way. Its designation in the New General Catalogue is NGC 6618. With a total mass of roughly 800 solar masses, M17 is also one of the most massive H II regions of our galaxy. The nebula occupies an area roughly 15 light years in diameter and is part of a larger cloud, which is about 40 light years in diameter. Messier 17 is located in the Sagittarius Arm of the Milky Way, the next inward spiral arm to our own, and may be part of the same giant cloud complex as its close neighbour, Messier 16 (the Eagle Nebula), located in the constellation Serpens. The Omega Nebula is just on the limit of naked eye detection in good conditions, with clear, dark skies and no light pollution. It is best observed in low-powered telescopes and binoculars. It lies in the same binocular field of view as Messier 16 and Messier 18, a faint open cluster in Sagittarius. Messier 17 is relatively easy to locate using the stars of the Teapot in Sagittarius. An imaginary line drawn from Kaus Australis past just to the left of Kaus Media to the north leads directly to M16 and M17. 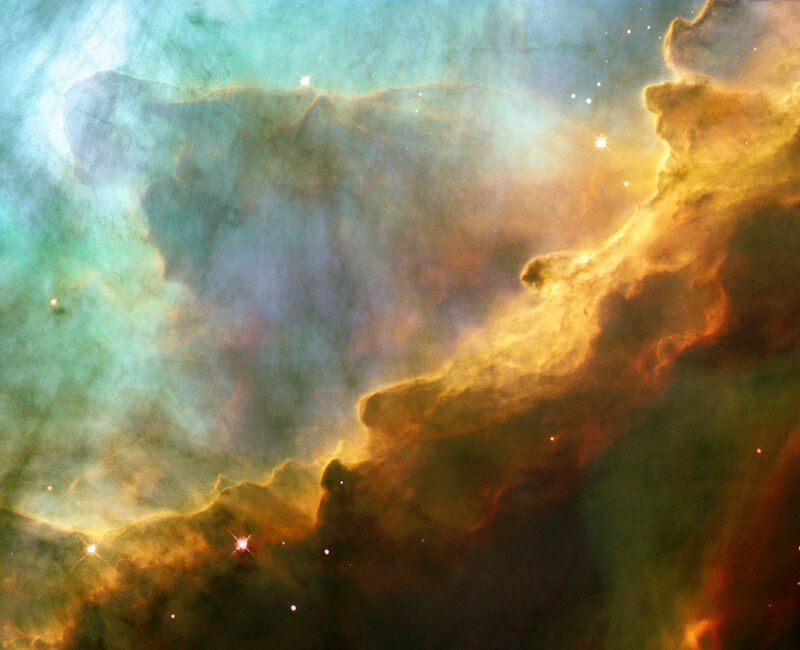 The Omega Nebula lies just to the south of the Eagle Nebula. Two other famous nebulae – the Trifid Nebula (Messier 20) and the Lagoon Nebula (Messier 8) are located in the same part of the sky. Messier 17 can also be found by star-hopping from the bright Altair in the constellation Aquila down the eagle’s back toward Gamma Scuti in the constellation Scutum. M16 and M17 lie just to the southwest of the star. The best time of year to observe the Omega Nebula and its neighbours is in the summer months, when Sagittarius hovers over the southern horizon in the evening. Messier 17 contains an open cluster of 35 hot, young stars which are responsible for the nebula’s glow. The cluster is only 1 million years old, which makes it one of the youngest known clusters in our galaxy. 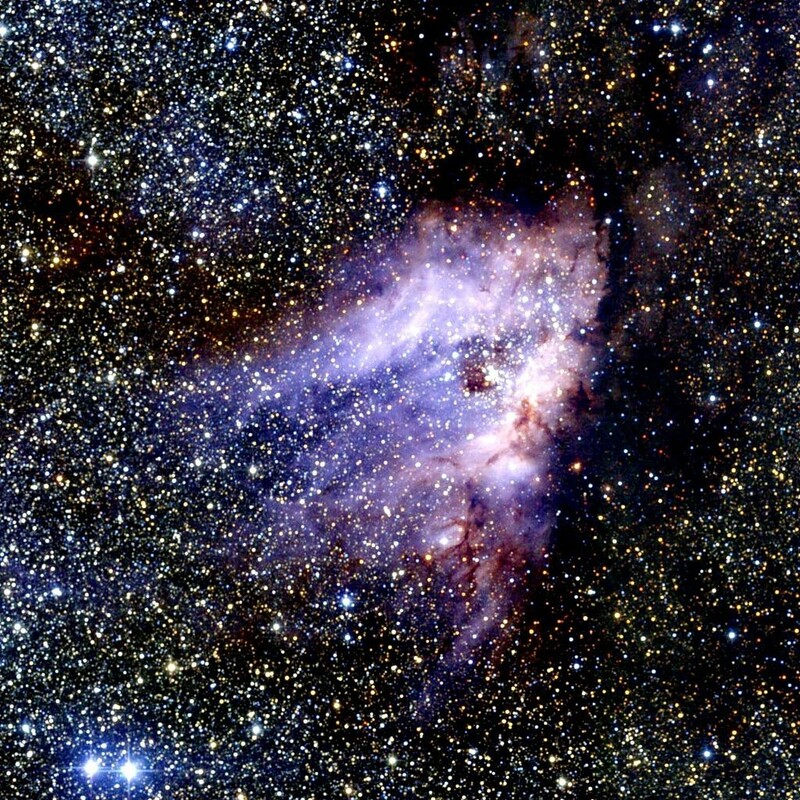 Astronomers using data from ESO’s Very Large Telescope (VLT), at the Paranal Observatory in Chile, have made an impressive composite of the nebula Messier 17, also known as the Omega Nebula or the Swan Nebula. 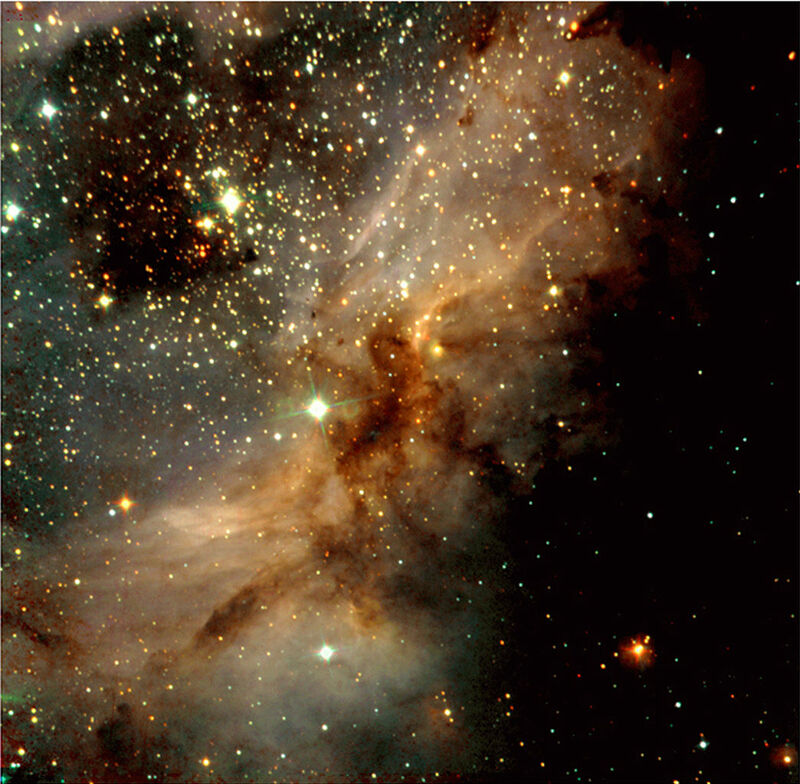 The painting-like image shows vast clouds of gas and dust illuminated by the intense radiation from young stars. 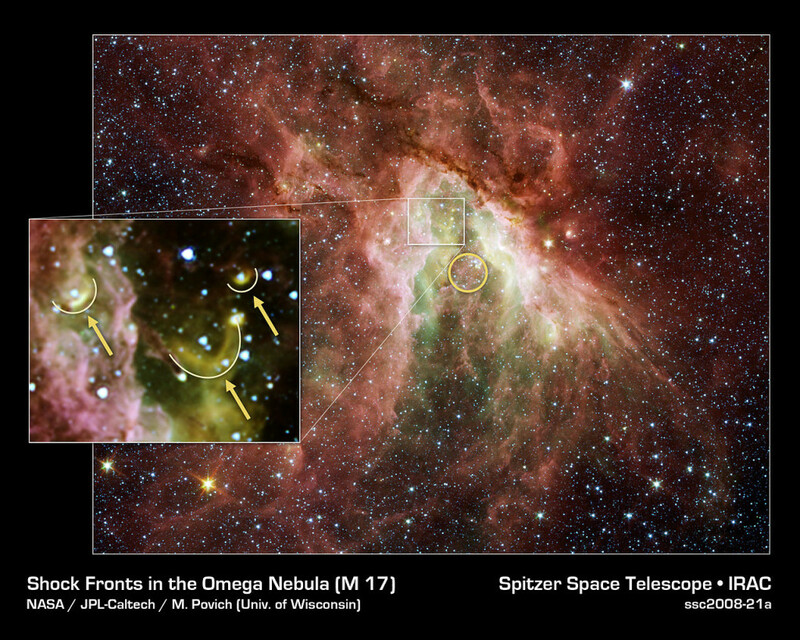 The image shows a central region about 15 light-years across, although the entire nebula is even larger, about 40 light-years in total. Messier 17 is in the constellation of Sagittarius (the Archer), about 6000 light-years from Earth. It is a popular target for amateur astronomers, who can obtain good quality images using small telescopes. The Omega Nebula is home to up to 800 stars, including nine stars of spectral type O and about 100 of spectral type earlier than B9. 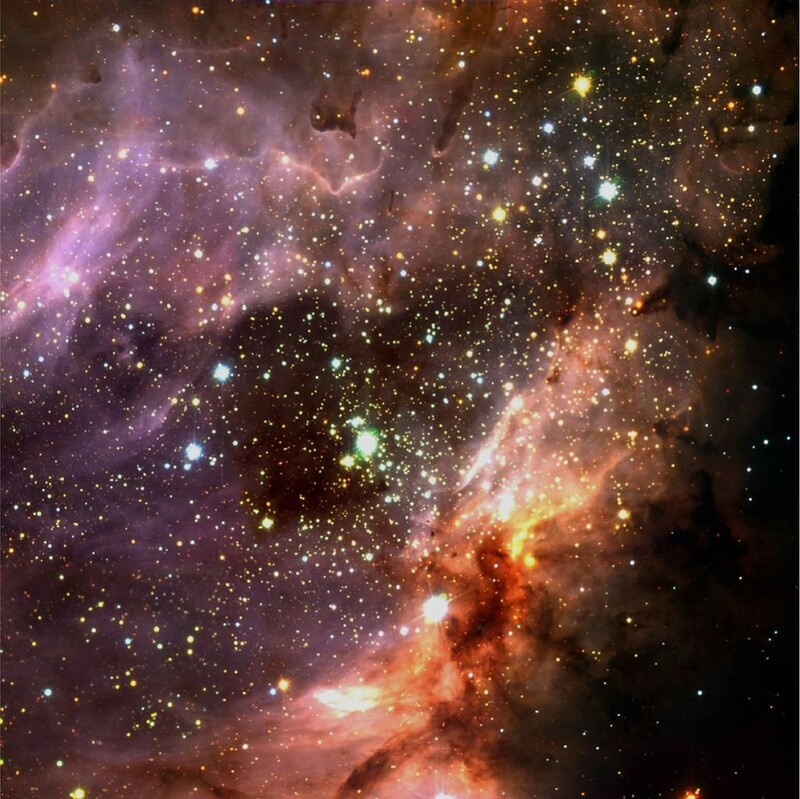 Additionally, there are more than a thousand stars in the process of forming in the nebula’s outer regions. 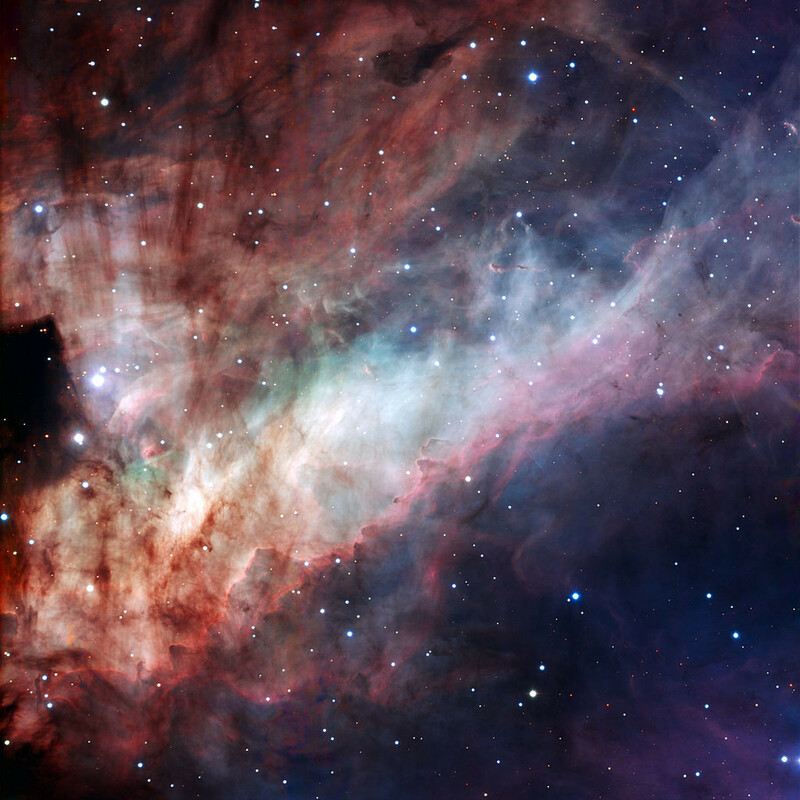 The young stars in M17 do not readily appear in visible light images, but are hidden within the nebula’s dust and gas. Even the light of the 35 brightest stars is obscured by the surrounding nebulosity. Messier 17 has a similar geometry to Messier 42, the famous Orion Nebula, but unlike M42, which appears face-on, M17 is seen edge-on. 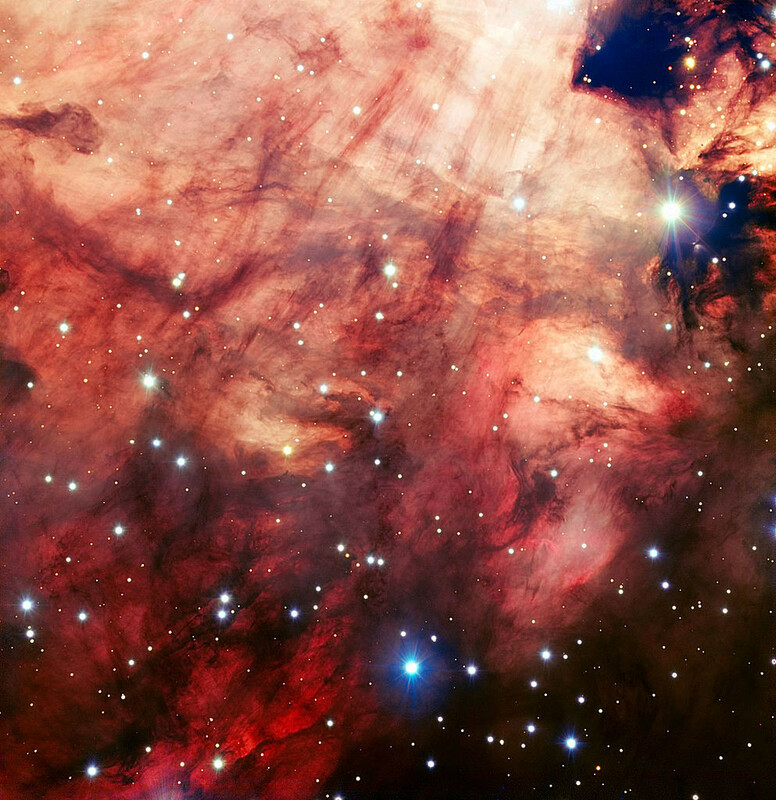 The Omega Nebula is considerably richer in star-forming material and young stars than M42, and it is also much more distant. The Orion Nebula lies some 1,300 light away from Earth and is located in the Orion Arm of the Milky Way, the same spiral arm that is home to our solar system. NASA’s Spitzer Space Telescope has captured a new, infrared view of the choppy star-making cloud called M17, also known as the Omega Nebula or the Swan Nebula. 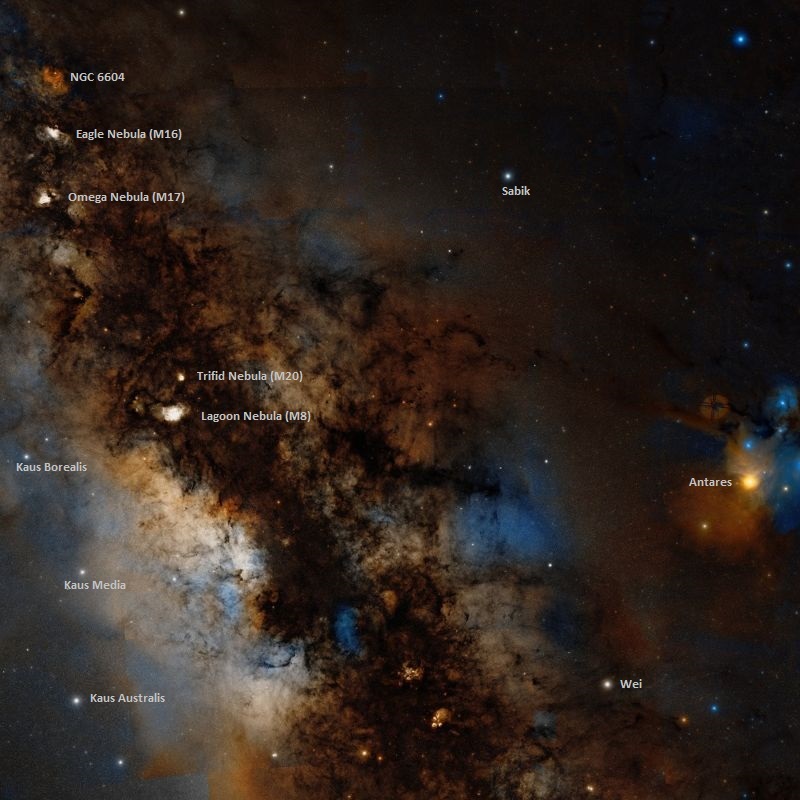 The cloud, located about 6,000 light-years away in the constellation Sagittarius, is dominated by a central group of massive stars — the most massive stars in the region (see yellow circle). 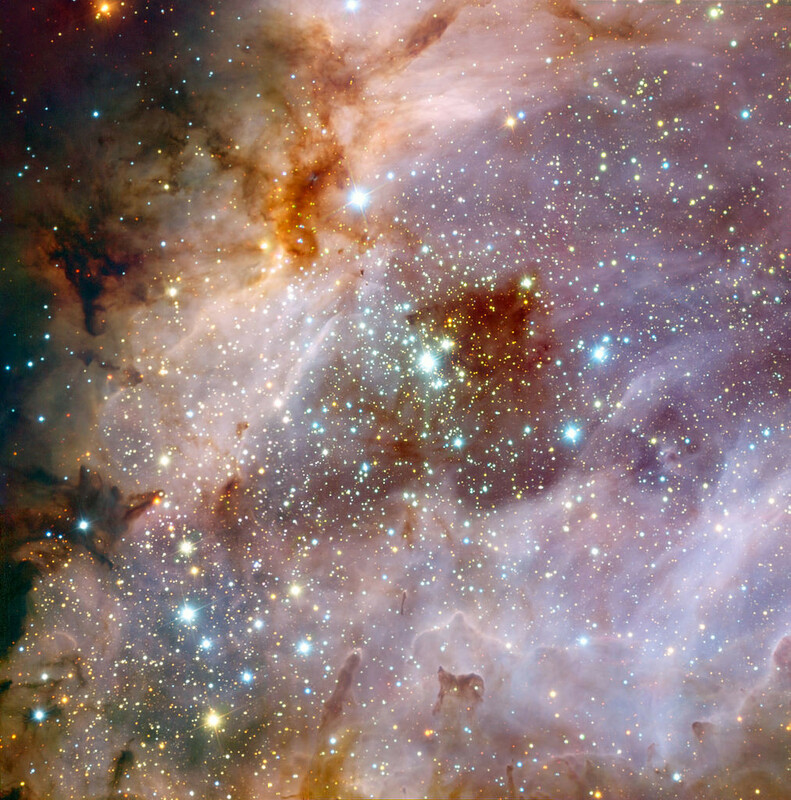 These central stars give off intense flows of expanding gas, which rush like rivers against dense piles of material, carving out the deep pocket at center of the picture. Winds from the region’s other massive stars push back against these oncoming rivers, creating bow shocks like those that pile up in front of speeding boats. Two blue hypergiants are believed to be associated with M17. HD 168607, a luminous blue variable (LBV), has a visual magnitude of 8.25 and can be seen in amateur telescopes. The star forms a pair with another blue hypergiant and suspected luminous blue variable, HD 168625, that lies just southeast of the nebula. HD 168607 is 240,000 times more luminous than the Sun, while HD 168625 has 220,000 solar luminosities. The nebula’s O-type stars and blue hypergiants will likely end their life in Type II supernova explosions in the not-too-distant future, astronomically speaking. Messier 17 (Omega Nebula). Image: Two Micron All Sky Survey (2MASS), a joint project of the University of Massachusetts and the Infrared Processing and Analysis Center/California Institute of Technology, funded by the National Aeronautics and Space Administration and the National Science Foundation. Finally, another nebula, which has never been observed. It is of a completely different shape than the others: It has perfectly the form of a ray, or of the tail of a comet, of 7′ length and 2′ broadth; its sides are exactly parallel and rather well terminated, as are its two ends. Its middle is whiter than the borders; I have found its RA for this year as 271d 32′ 35″ and its southern declination as 16d 15′ 6″. It has an angle [PA] of 50 deg with the meridian. In the same night [June 3 to 4, 1764], I have discovered at little distance of the cluster of stars of which I just have told, a train of light of five or six minutes of arc in extension, in the shape of a spindle, & in almost the same [shape] as that in the girdle of Andromeda [M31]; but of a very faint light, not containing any star; one can see two of them nearby which are telescopic & placed parallel to the Equator: in a good sky one perceives very well that nebula with an ordinary [non-achromatic] refractor of 3 feet & a half [FL]. I have determined its position in right ascension of 271d 45′ 48″, & its declination of 16d 14′ 44″ south. A wonderful nebula. 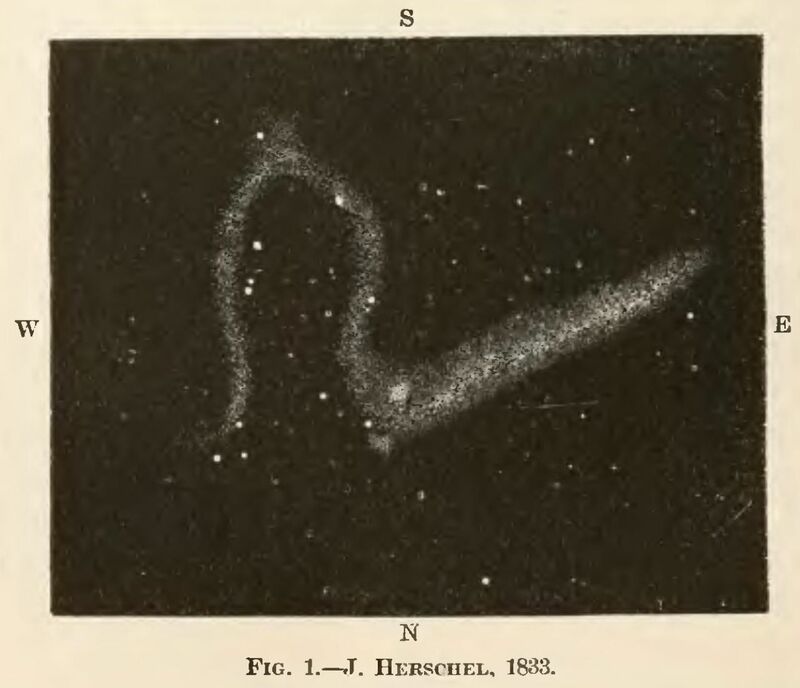 Very much extended, with a hook on the preceding [western] side; the nebulosity of the milky kind; several stars visible in it, but they seem to have no connection with the nebula, which is far more distant. I saw it only through short intervals of flying clouds and haziness; but the extent of the light including the hook is above 10′. I suspect besides, that on the following [eastern] side it goes on much farther and diffuses itself towards the north and south. It is not of equal brightness throughout and has one or more places where the milky nebulosity seems to degenerate into the resolvable [mottled] kind; such a one is that just following the hook towards the north. Should this be confirmed on a very fine night, it would bring on the step between these two nebulosities which is at present wanting, and would lead us to surmise that this nebula is a stupendous stratum of immensely distant fixed stars, some of whose branches come near enough to us to be visible as a resolvable nebulosity, while the rest runs on to so great a distance as only to appear under the milky form. The figure of this nebula is nearly that of the Greek capital Omega, somewhat distorted and very unequally bright. It is remarkable that this is the form usually attributed to the great nebula in Orion, though in that nebula I confess I can discern no resemblence whatever to the Greek letter. Messier perceived only the bright preceding branch of the nebula now in question, without any of the attached convolutions which were first noticed by my Father. 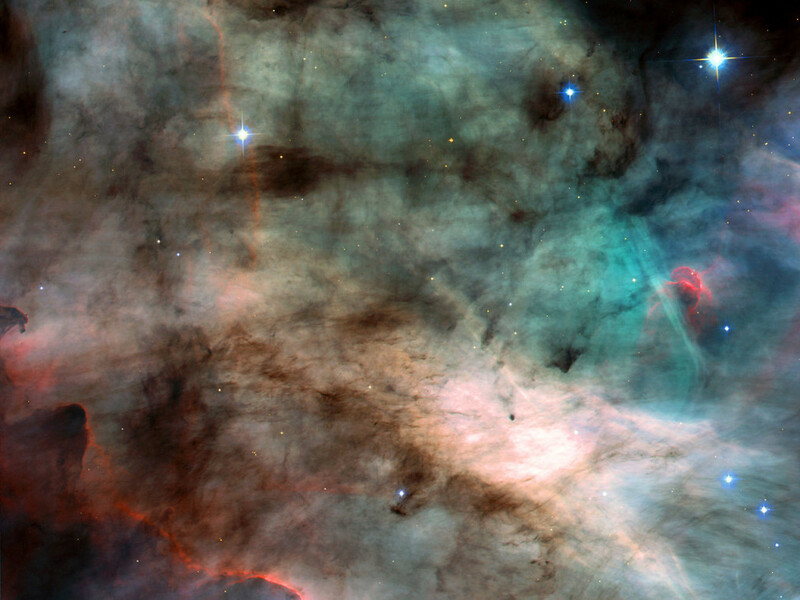 The chief peculiarities which I have observed in it are, 1st, the resolvable knot in the following portion of the bright branch, which is in a considerable degree insulated from the surrounding nebula; strongly suggesting the idea of an absorption of nebulous matter; and 2ndly, the much feebler and smaller knot in the north preceding end of the same branch, where the nebula makes a sudden bend at an acute angle. With a view to a more exact representation of this curious nebula, I have at different times taken micrometrical measures of the relative places of the stars in and near it, by which, when laid down on the chart, its limits may be traced and identified, as I hope soon to have better opportunity to do than its low situation in this latitudes will permit. Messier 17, as drawn by William Lassell in 1862. Source: Popular Science Monthly Volume 8. 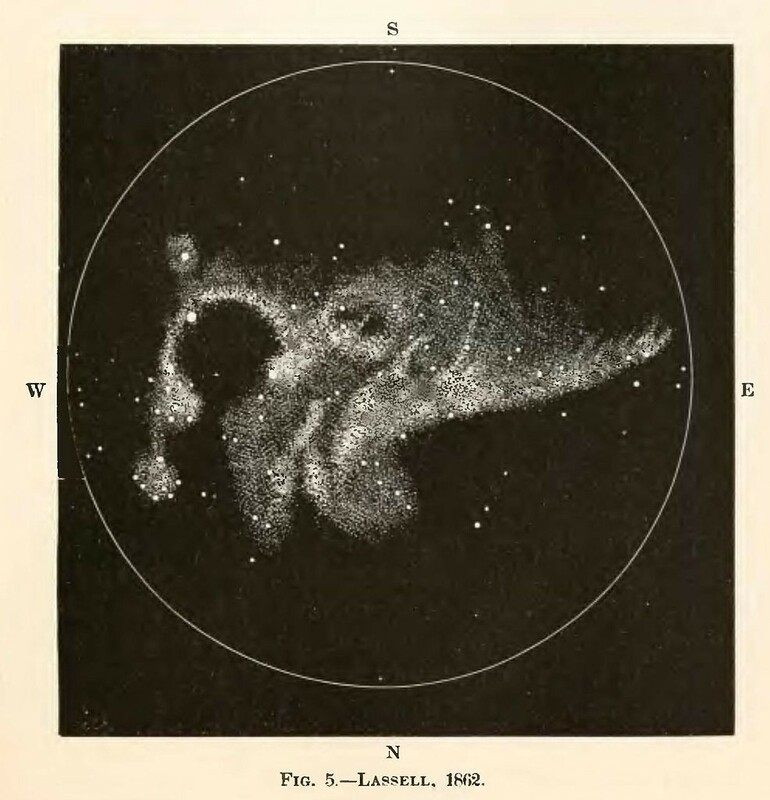 English astronomer William Lassell also made a sketch of the Omega Nebula in 1862 using a 4-foot telescope at Malta, as did Edward Singleton Holden and M. Étienne Léopold Trouvelot in 1875, using a 26-inch refractor of the United States Naval Observatory at Foggy Bottom, Washington, DC. 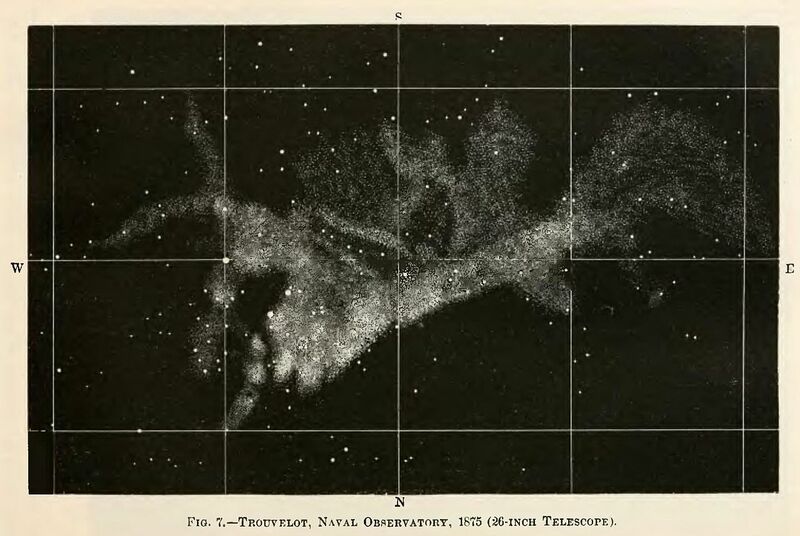 The horse-shoe, or Greek-omega Omega, nebula, just below Sobieski’s shield; discovered by M. Messier in 1764, and registered as a train of light without stars, about 5′ or 6′ in extent. 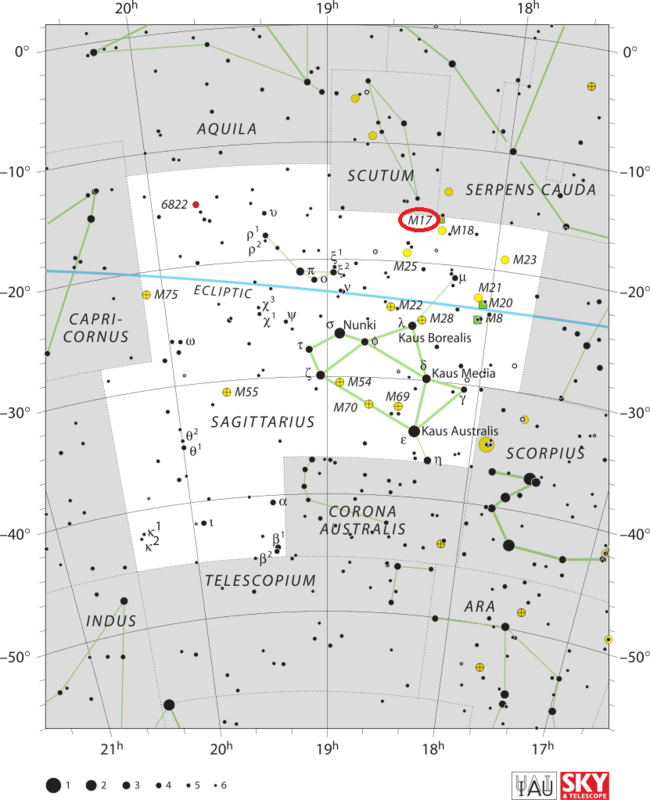 As with the two preceding objects [M16 and M18], its place hangs upon Mu Sagittarii, from which it bears north-by-east, about 5deg distant, in the line towards Epsilon Aquilae. In my telescope charged with a moderate [magnification] eye-piece, this curious nebula is well seen, though not to the extent of convolution figured by Sir John Herschel. A magnificient, arched, and irresolvable luminosity occupies more than one third of the area, in a splendid group of stars, among which are Nos. 38 and 43, Hora XVIII. of Piazzi; they are principally from the 9th to the 12th magnitudes, reaching more or less all over the field, somewhat in the accompanying form.